Take one jalapeño and carefully cut the surface of the length (leaving the stem) to reveal the seeds. Use a small spoon to remove the steeds. Repeat the process with the rest of the peppers. Wash with water to be sure all the seeds are out and then dry with paper towel. Mix the cheeses in a bowl. Set aside. Cook the bacon in a medium saucepan over medium heat until they're crunchy. Place them on a dish lined with paper towels to absorb the excess oil. Let cool briefly and cut into small pieces. Mix the bacon with the cheeses. Preheat the oven to 350° F. Cover a cookie dish in parchment paper. Mix the egg and water in a small bowl. Set aside. Fill the jalapeños with the cheese and bacon mixture. Open the package of breadsticks according to the instructions on the package. Unroll the dough and carefully separate so as not to break them. 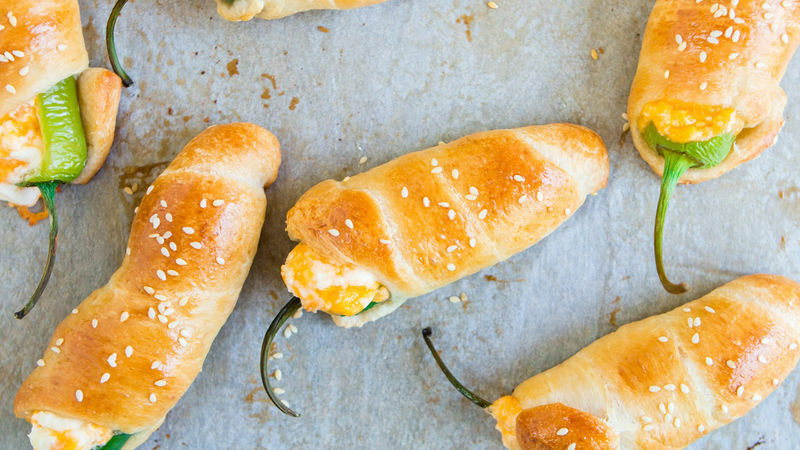 Take a jalapeño and roll into a breadstick. Start with the smallest end and roll up until you reach the stem. Place on the tray and repeat until you're done. Cover the rolls with the egg mixture and sprinkle with sesame seeds. Bake for 20 minutes or until the rolls are golden brown. When you remove the seeds from the jalapeños be very careful as they are very spicy. Wash your hands thoroughly when done. I assure you that these jalapeño rolls will be a great success at any reunion. The slightly sweet flavor of the Pillsbury™ breadsticks combined with the cheese, bacon and spicy jalapeños is absolutely perfect. Serve them for your friends and family to enjoy the big soccer championship matches!